Caiman free games: Bet-5 Casino by Charnock Wood interactive. 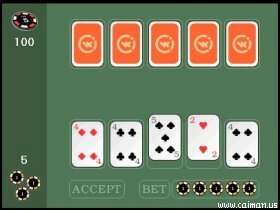 The player is allowed 1 draw by selecting any unwanted cards up to a maximum of 3. During selection the player can increase the bet up to 5 if he/she thinks chances of winning are high. After a draw, selected cards will be replaced by new cards from the deck. The dealer will do the same after which the best set will win. 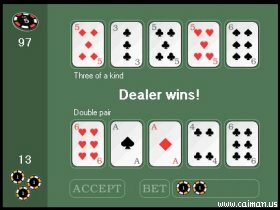 If both player and dealer have a similar set, the turn will end in a draw, causing the bet to return to the player. The game will end if the player has cleared out the bank or if the player is out of money.